State Propositions Failed … Now What? California voters rejected Propositions 1A-1E last night, defeating a rotten budget deal that Governor Schwarzenegger and the legislature’s Republicans effectively forced on reluctant Democrats. Liberal legislators campaigned for them against their progressive base, believing it was the best that could be done to avoid horrific budget cuts. But the measures were merely a symptom of how broken our state budget situation is, and now progressives are clamoring for reform to prevent such an outcome from happening again. Now is time – more than ever – for a statewide grassroots campaign to eliminate the “two-thirds” majority requirement for passing a state budget (including taxes), and there will be activists eager to help gather signatures for the 2010 election. A Constitutional Convention is also in the realm of possibility, and progressive groups like the Courage Campaign are on record supporting it. But first we must organize to forestall the more awful, short-term budget cuts – which include: (a) pressuring federal officials to hold firm on Arnold’s pleas to cut services without consequences, and (b) push the state legislature to re-introduce a “majority budget” that was tried last December. What Do the May 19th Results Mean? First, it’s important to state the obvious. These election results are a stunning defeat for Governor Arnold Schwarzenegger, who for the last six years has driven us on a path to bankruptcy through a lethal combination of tax cuts, and borrowing money to avoid raising taxes on the rich and corporations. Once again, the Terminator has called for a special election – and once again, he has been humiliated. Arnold wasn’t even in the state to witness the results, and the “yes” campaign did not throw an Election Night party. The Governor was in Washington DC, trying to get permission from the feds to cut social services. The defeat of these propositions was not a “mandate” against taxes, as much as the right-wing Howard Jarvis extremists will claim otherwise. At the same time these measures were failing, the city of Palmdale in L.A. County (home of the late anti-gay bigot Pete Knight) passed a hotel tax by a 2-1 margin. Progressives opposed Prop 1A because of its “spending cap” provisions, and the state Democratic Party’s refusal to endorse it lent credence to that argument. If there’s any overriding conclusion from this election, it is that voters are angry at our leaders in Sacramento, disgusted with the budget situation and insulted that politicians had punted to the people to ratify a set of complex initiatives. Arguably, the defeat of Propositions 1D and 1E can be viewed as a mandate to protect money for children’s health and mental health services. One Republican politician even admitted to the Sacramento Bee a few weeks ago that it would be a “fair argument” to interpret the results that way. As the Governor and state legislature convene today to consider plugging a $21 billion deficit, the message is to avoid touching these programs. The natural solution to this mess is to bring back democracy for how California passes a state budget, by eliminating the disastrous “two-thirds rule” that has paralyzed the state. Every single year, the right-wing Republican minority in Sacramento – who due to the state’s shifting demographics can never hope to win a majority of the legislature – have effectively controlled the state budget by refusing to vote for a single tax increase whatsoever in any way, shape or form. But getting this in front of voters won’t happen before 2010, while we have a crisis in the short-term to address. Make no mistake about it, there will be dreadful budget cuts coming out of Sacramento – but this would also have been the case if the voters had passed these propositions. We would be facing a $15 billion deficit, rather than a $21 billion deficit. Now we know what Schwarzenegger will be pushing for – “cut and borrow” – and there must be an organized and vigilant fight to resist cuts affecting the most vulnerable Californians. And in the latter category, we might be getting help from the federal government. According to the May 8th edition of the Los Angeles Times, the Obama Administration reportedly threatened to withhold federal stimulus funds if Schwarzenegger followed through with his plan to cut wages for unionized health care workers. There is only so much Arnold can cut, before the federal government can start to use repercussions. The Governor knows this, which is why he was in Washington yesterday. His office confirms that he’ll be meeting today with Health & Human Services Secretary Kathleen Sebelius – as he seeks “special permission” to make $750 million in cuts to the Medi-Cal. Efforts by concerned Californians to contact their elected leaders in Washington will be critical. Arnold has also talked about borrowing money from local governments – which the state Constitution allows him to do if he can declare a “state of emergency.” But he will need two-thirds of the state legislature to go along, and the idea of borrowing money (which is a main reason why we got into this mess) from local government (which needs the money just as badly as the state) is sick. Of course, Republicans in the state legislature will refuse to support any tax increases – as they view this budget crisis as an opportunity to shrink the size of government until they can drown it in a bathtub. And in this crunch, it is time to make them irrelevant. Democrats in the legislature must try again what they did in December – pass a “majority-vote budget.” If the budget is revenue-neutral (in the sense that there is no net tax increase), but we substitute “taxes” for “fees,” they can legally pass it with a bare majority. 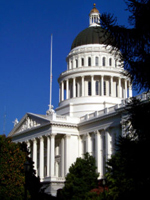 Senate President Darrell Steinberg has suggested they will be giving it another shot, which could forestall deeper budget cuts. Arnold vetoed the “majority-vote budget” in December, but with fewer options he may be pressured to sign it this time. Revenue measures that should be in this budget include: (a) an oil severance tax, as California is the only oil-producing state without one, (b) do what Republican Governors Pete Wilson and Ronald Reagan had the courage to support in hard times – i.e., temporarily raise the upper-income tax bracket, and (c) increase the alcohol tax. Unlike other taxes, polls show all three of these proposals to be very popular with voters. It will set the stage for a long-term solution: ending the “two-thirds” rule. One of the worst mistakes in recent political history was that the California Democratic Party never collected signatures last year for the November 2008 election to scrap the “two-thirds rule.” But it’s too late to dwell on the past, and must focus on the future. According to the Secretary of State’s website, there are two initiatives currently in circulation to scrap the “two-thirds rule” – one for just the budget, and the other for the budget and taxes. Both circulation drives are funded by the Democratic legislative leadership, and people should get involved to gather signatures now – while the public is more focused on the issue. There is also talk of a Constitutional Convention, and progressive groups like the Courage Campaign have publicly endorsed it. Our state Constitution currently looks like a phone book, and it may be time to get a clean slate and start over. The idea is not unprecedented – other states have pressed the “reset” button every few years, and it may work if the Convention truly represents the diversity of California. Of course, two-thirds of the state legislature would have to call it, or else the voters would have to pass a citizen-initiated Proposition to demand it. For the past three months, progressive activists and Democratic politicians have been on the opposite sides of the special election measures – which had stalled common efforts to repeal the “two-thirds rule” and the kind of budget reform we need. Now is the time to come back together, focus on the future and get the permanent change that’s needed. Activists are ready, willing and able to repeal the “two-thirds rule,” and state Democratic Chair John Burton has ensured it will be his priority. We have no choice but to succeed.